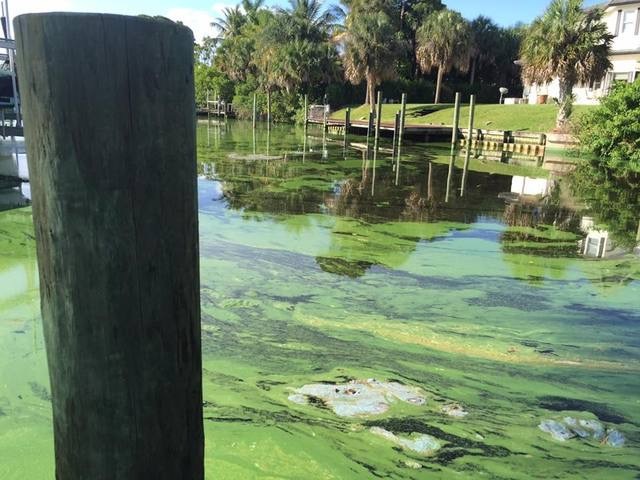 Blue green algae in Stuart, FL, a Republican stronghold. Photo courtesy of WPTV. (Originally published July 1, 2016. Updated, July 4.) An unprecedented media frenzy is now covering Florida's diseased waters. The visuals are compelling. Dead fish. Green slime. Videos of toxic scum carpeting backyard canals and rivers like alien foam are all over the internet and social media. Predictably, Florida politicians are following, because the 24/7 news cycle is opportunity and peril wrapped in one fearsome soundbite. Just one example; the presumptive GOP candidate to be Florida's next governor in two years, Agriculture Secretary Adam Putnam, last week quietly withdrew a proposal by Big Ag to reduce water quality standards. Thousands of Floridians formed on a Martin County beach two days ago; spelling out a S.O.S. to the media and anyone who can see Florida from far away: "Buy the Land!" The message meaning is clear to activists who have been trying, for decades to draw attention to the way the state's constant erosion against water quality protections was putting the public in harm's way, just like it has been in Flint, Michigan. In many respects, Florida's is a much, much larger problem. In Flint, eventually the lead pipes can be replaced and water treatment plants upgraded. In Florida, the entire political system is based on giving Big Agriculture -- mainly Big Sugar south of Lake Okeechobee -- whatever it wants in terms of "limited government" to reduce the power of regulators. Although the news cycle is making tangential reference to the thick carpet of toxic blue green algae covering miles of South Florida waterways and the influence of Big Ag, it has yet to drill down into the corrupt mess to find the state's biggest campaign contributors, Big Sugar billionaires, hiding there. After historic rainfall events in early 2016 forced the early opening of Lake Okeechobee floodgates by the U.S. Army Corps of Engineers, Big Sugar -- principally, U.S. Sugar Corporation, the largest sugarcane producer in the state -- flooded local newspapers with full page advertisements and local TV news with commercials. It organized its own paid fake "news" and OPEDs by civic proxies. In its PR campaign, Big Sugar blamed everyone and everything; casting doubt and aspersions against local sewer practices, against wealthy coastal environmentalists, against the sun rising in the east and setting in the west. Big Sugar says "stay the course", without acknowledging that course it designed has been an abject failure. Since the 24/7 news cycle descended on Florida, Big Sugar's self-serving advertisements have disappeared. It is as if industry executives and their marketing strategists decided that while the TV cameras are focused on problems they caused, the best course is to lie low and hope that only a few of the dots get connected. What really worries Big Sugar: that its role in this water quality catastrophe, suddenly visible, could become a real liability to politicians it has funded in local, state and national elections. Shadow governments need darkness not light. 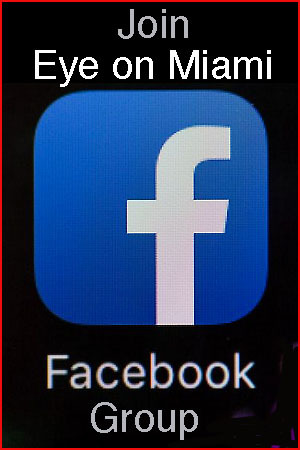 The uproar -- first igniting on social media a year ago (I have called it, Florida's Arab Spring) -- is unprecedented. For one, the worst affected communities are predominantly GOP strongholds on the east and west coast. When given the chance to express themselves at the ballot box in last March's presidential primary, these voters rabidly turned against Marco Rubio. Rubio never saw what hit him; his own record as a proxy for Big Sugar. For decades, Big Sugar has rallied the interests of conservatives in "limited government", locking down both the executive mansion and the state legislature in the process. 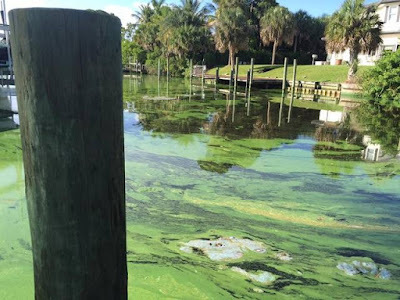 What today's stinking, repulsive algae blooms reveal is that the net result of Florida's embrace of "limited government" caused this water quality catastrophe. The governor's appointees to the board of the South Florida Water Management District have been exemplary public servants of an entrenched status quo. Board members like Kevin Powers had become smug and self-satisfied in their outright contempt for those who demanded that the the state "buy the land" in sugarcane production south of Lake Okeechobee in the Everglades Agricultural Area. At one memorable District meeting last year, actors hired from Miami -- tied to one of the governing board members, James J. Moran -- waged a counter-protest against citizens demanding the state purchase Big Sugar lands. Gov. Scott, Agriculture Secretary Adam Putnam, and Senate President Negron pushed back against Bullsugar.org and groups like the SWFL Clean Water Movement without much attention by the national press until -- wham! -- disaster struck. Last week Senator Rubio toured Martin County coastline coated with toxic scum. A yacht bearing the senator and entourage arrived to a press conference while noisy protesters gathered on the shore, faces covered in masks in an effort to filter the stench of the St. Lucie River. Senator Rubio seemed half-hearted in his attempt to portray himself as deeply concerned. His record in Florida is tirelessly working on behalf of Big Sugar to lower water quality standards. In 2003, Rubio was a whip for Gov. Jeb Bush on a bill lowering Everglades water quality standards crowd-swarmed by sugar lobbyists. That new law was successfully challenged by Friends of the Everglades and the Miccosukee Tribe in federal court but caused a decade delay in water quality improvements, setting up today's disaster. For press conferences as he tries to retain his US Senate seat, Rubio will have worked out his talking points well in advance with the help of another former state legislator; Gaston Cantens who also proved his mettle on the 2003 bill and is now comfortably ensconced as government lobbyist for the Fanjuls. After leaving the legislature, Rubio moved back to Miami picking up local lawyering and lobbying on land use zoning changes. In 2010, he was called off the back bench by the Fanjuls (Florida Crystal's owners) to run against former Gov. Charlie Crist. Crist had signed a deal with the Fanjul's cartel competitor, U.S. Sugar, to put its lands in public ownership; a land purchase that, had it been made at the time, would have set the state on a course to fix its water quality catastrophe. Amidst last week's media furor, Florida's other U.S. Senator, Bill Nelson -- a Democrat -- uttered an eventuality that has never been heard in public by a major state elected official, "eminent domain". According to a Treasure Coast Palm report, Nelson supports the legal measure to compel unwilling sellers forward. Senator Nelson raised the possibility of government initiating a legal taking of sugar lands south of the diseased lake for the purpose of creating adequate acreage to store and cleanse overflow so that the St. Lucie and Caloosahatchee rivers have a chance for recovery. When questioned on Senator Nelson's unprecedented recommendation -- one that the senator had never made before during an era when environmentalists were calling for eminent domain in the Everglades Agricultural Area -- Big Sugar refused comment. Meanwhile State Senate President Joe Negron, whose district is smack in the middle of the blue-green algae wasteland, assured the press that he is actively discussing land acquisition with his Big Sugar allies. Negron won't answer the questions; when coastal real estate are turned into sacrifice zones, isn't that a form of "taking"? When coastal real estate turns worthless because touching river water or breathing the fumes from stinking, toxic algae is a very real health hazard, isn't that a de facto "taking"? Negron says, "eminent domain" is the wrong way to go, but he hasn't addressed how this water quality catastrophe reveals Republican picking winners and losers; a form of taxation without representation on millions of affected Floridians. 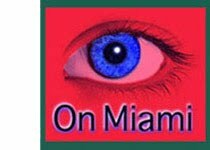 This is a crisis that anyone with eyes open saw on the horizon, not one or two years ago, but 20 years ago when Lawton Chiles -- the last Democratic governor of Florida -- convened the Governor's Commission for a Sustainable South Florida. The blue ribbon panel, comprising nearly two dozen stakeholders and government representatives had only a couple of environmental representatives. The Commission had been formed as a result of the state's 1992 capitulation to a federal lawsuit against Big Sugar's nutrient pollution of the Everglades. Although the current media attention is unlikely to cast a glance backwards to report on a study two decades old, the report's conclusions classically dovetail with what special interests wanted. Just like Big Tobacco with lung cancer and Big Oil with climate change, Big Sugar pushed back hard against governmental intervention that could hamper its profits. Out of the Governor's Commission came support, only a few years later, for the Comprehensive Everglades Restoration Plan. CERP wasn't comprehensive at all, because its cornerstone was not land for water storage and cleansing marshes but deep wells to inject billions of gallons in so- called "aquifer storage and recovery" wells. ASR was the three billion dollar pipe dream around which all other projects flowed, from 2000 to the present day. Adequate water storage -- today's issue -- was studiously and zealously blocked, and not a single state politician objected at the time. Today's water quality catastrophe is the result of that misdirection. Then, there is Gov. Rick Scott. 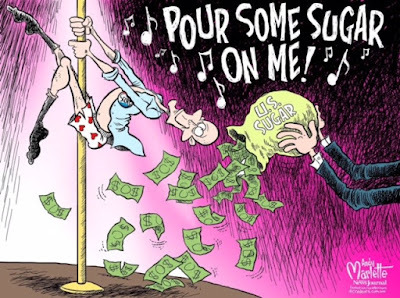 The Tampa Bay Times recently reported that Scott and his related political committee received another $100,000 check from U.S. Sugar Corporation; a drop in the bucket of millions of dollars the industry spends to protect its privileged status and federal subsidies. Where is the Florida Tea Party on this water quality crisis? At the end of the day, taxpayers will pay for Big Sugar's land. "Buy the land" means using taxpayer dollars to make Big Sugar even richer than the industry is today, thanks to federal subsidies in the U.S. Farm Bill. Taxpayers have already paid billions in Everglades restoration that is, in essence, a work-around of sugar farmed on 400,000 acres south of Lake Okeechobee. Taxpayers are paying for the South Florida Water Management District's spin machine's irresponsible "myth versus fact" covering the prevailing myth of the state GOP: that the federal government is to blame for the state's water quality catastrophe. One of the reasons the Florida Tea Party is silent: it is likely funded by the polluters as it is elsewhere in the nation. What all this media attention may do, finally, is cause Florida taxpayers and voters to wake up to the fact they did this all by themselves; electing generation after generation of politicians who refused to stand up to Big Sugar while allowing the conditions for Florida's water quality catastrophe to silently build and release with the force of a river bursting through a dike. If you are skeptical about this analysis; take the time to find out for yourselves: in the past twenty years, has any state agency undertaken to regulate either blue-green toxic algae or to put tough numerical standards to regulations limiting nutrient pollution and chemicals contribution to algae blooms? Has any state agency gathered and released statistics on the incidence and location of rare bacterial infections caused by contact with contaminated river or ocean water in Florida? The answer to these questions is "no", and if you can't understand the reasons why, go back and read this report again. From the beginning. Impeach Suga Britches, get the Rick Snott out of our water! Stand up to big sugar? HELL! They walk hand in hand with big sugar! Little Mario and Skeletor Scott open their pockets and take all they can, AND they aren't the only ones! Let's stop eating toxic Florida sugar. It's toxic to our bodies as well as to our waterways. Boycott Sugar and Vote out every last one of their dirty politicians in every office at every level. For some reason Big Sugar lobbyist is sending money and strategists to help Michelle Franklin who is running for Property Appraiser. Clearly Big Sugar thinks every office matters. They want to lock up every avenue for changing the situation. I again thank you for your informative reporting and marvel at how you consistently do so - while the dumb voters continue to march to the poles voting in DickScotts, nothing gets done - and you don't just hurl yourself off a building from frustration! Thanks for not doing so. wow. thank you. It's been a week but there is no way to tell you what the smell is here. I've seen a lot of heros but local regular people who are my friends. But I still still politicians playing games with out water. This has got to end. The locks were slowed down not shut off and we still do not have a federal emergency here which we desperately need. Joe Negron, marco rubio, gayle harrell, marylynn magar all have the same talking points. They care nothing for us. Because if they did they would fix the issue. No more sugar in my house ! Why does it seem only way to stop this is take away their market. Bless you for speaking out and keeping on the crooked politicians who could have chose to make a difference. They need to take a swim in these waters every day along with their families. After all they seem to think it is ok for us to do so. Dumbass conservatives in Fla. vote. Dumbass liberals in Fla. stay home. Conservatives love showering businesses with corporate welfare and eliminating regulations and penalties for pollution and unsafe work places. The governmental corruption in Fla. goes on unchecked and is treated as a joke. 'News' sources are spayed and neutered by the corporate sponsors and pay more attention to bear hunts and lost animals than to permanent damage to the environmental infrastructure that supports human life. Most of the citizens of this state are either asleep, tragically ignorant or just morons. Fla. voters must vote out ALL repubs and replace them with 'crats, indies, green party people......(ABR) anything but republicans in Nov. and through the next four election cycles. Florida needs an enema and the hose goes in Tallahassee. I agree with every thing this article says BUT we did NOT vote for this!! Our election machines were rigged to give GWBush the White House and they are still rigged to Republican votes to count and Democratic to toss aside, our election process is corrupt just like the politicians so No, the majority of us Did Not vote these terrorists into office to ruin our beautiful state. Rick Scott? Shame Florida has so many idiot voters who elected him twice. Dude should be in prison. I also remember, as I'm sure you do, the long history of the North vs South Florida battle lines drawn in the Tallahassee legislature. For a long time it seemed that anything that appeared to benefit the (Democratic) South was automatically opposed by the (Republican and Dixiecrat) North. Kind of a remnant of the Civil War/Reconstruction divisions. It may be true that 'the people of Florida' have continued to elect these corrupt reprobates, but when you get more granular, the nuances emerge. What has happened is that the old Republican-Dixiecrat alliance has seen the Dixies move home to the Republican Party, and so we have the current imbalance. Not that Republican pols are the only ones corrupted by BS (Big Sugar); it's systemic. It's an old, Biblical even, tactic to poison your enemy's well, just as has happened with Okeechobee. The problem for the current administration is that the poison got routed to the wrong places. As one who grew up around Lake Okeechobee in the seventies and eighties I watched big sugar overtake other less polluting ag crops. I clearly remember how our local waterways suffered and became the same turbid and algae ladden disasters after big sugar came in as what is now happening on the coasts. Inherently sugar cane needs a lot of nutrients and a lot of water. And when sugarcane fields are burnt the ashes float down as phosphorous to the ground. Once sugar cane fields grow unproductive after a few years they are disked and flooded for a few months then all that nutrient and phosphate ladden water ends up in our canals, Lake O, and then out to our coasts. I know this is how it works. So it's no wonder that after decades of nutrient accumulation and concentration that this disaster has happened. Was just a matter of time. One other dirty little secret is that the muck soil of the sugar lands is oxidizing and in a few years the ag land will be mostly unproductive. Unfortunately we can't wait for that other eventuality. We must buy the land now, stop the Big Sugar pollution, and provide a more natural path for the waters to head south and be cleansed along the way. We couldn't continue on this way, with the alteration of the Everglades for sugar and development. Nature is retaliating. This was 50+ years in the making. Add in climate change to the sugar-blocked Everglades flow and Phosphorus-laden Lake O water to the coasts, and you've got a recipie for toxic algae. Gov. Scott is corrupt. He aligned himself with Big Sugar to get into office, installed a pro-sugar water management board and unraveled the US Sugar deal. Rubio is also in bed with Big Sugar. Florida Dems take sugar money and do little except for a few heros like Mark Pafford. Sugar is playing them all. Now is it's an international story that will harm all of Florida's tourism industry. You reap what you sow. There is a petition moving around for Publix to discontinue buying their sugar coming from Florida fields. Hopefully will gain some traction and if Publix does so will be hitting the Florida Sugar Industry where it hurts the most. Their pocket book. Unfortunately a boycott of big suar will do absolutely nothing and shows how locals still can't quite grasp their power, influence, control and reach. They are top of the sugar chain globally our local boycott is humorous to them. Go to www.change.org to sign petition to tell Publix to stop buying sugar from big sugar in S. Fla.